The Washington State University Alumni Association has doubled its membership in just a few short years, thanks in part to its stellar benefits. But they were still missing out on a segment of alumni and knew they could use alumni membership marketing to assist in getting the word out and drive more alumni to become card-carrying members of the WSUAA. 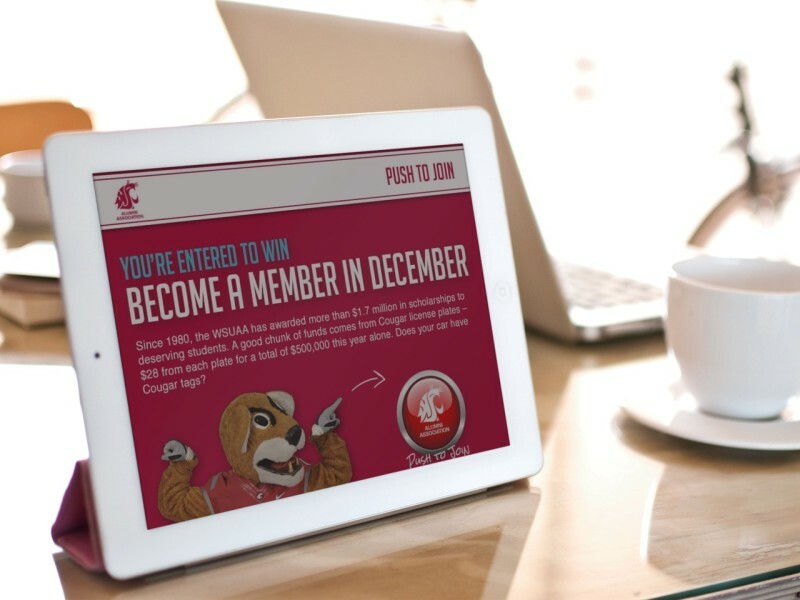 WSU’s Become a Member in December campaign with MSM employed daily giveaways paired with value propositions that shared the top five reasons to join the WSUAA with participants. Joining was easy thanks to an MSM alumni membership microsite, which included a simple, mobile optimized payment form connected directly to the WSUAA’s existing bank account. Everyone who joined the WSUAA during the promotion also received an “easy button” that played the WSU Fight Song. Post by Washington State University Alumni Association. MSM’s alumni membership microsites amp up your recruiting efforts by scaling back your existing content. That’s right – less is more when it comes to convincing a graduate to join your alumni association. We all know most people don’t read (sniff). So the mile long list of benefits on your alumni website? It’s not entertaining many eyeballs. MSM’s alumni membership microsites get to the heart of your alumni association, reframing it’s spirit and benefits for maximum impact in the fewest words possible.